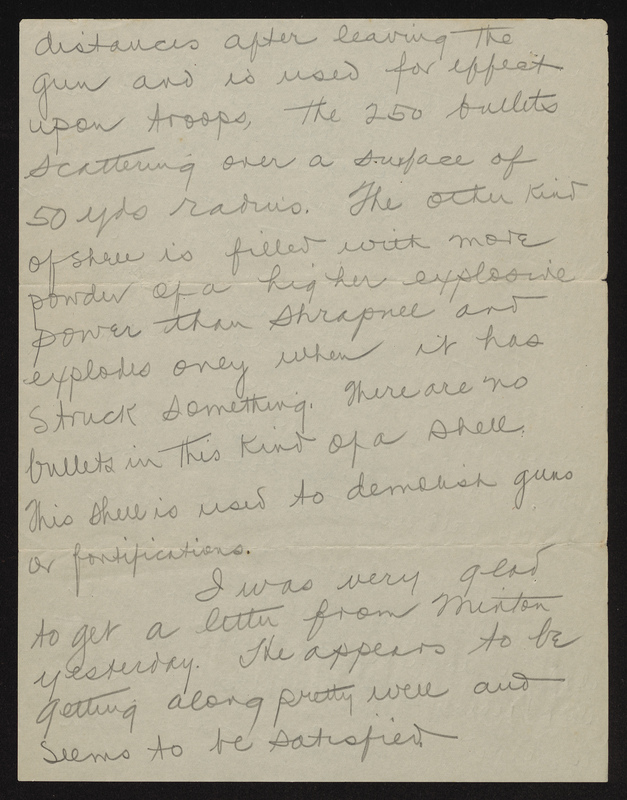 Letter from Richard Dillard Dixon written to his father on April 15th, 1918. While the trip to the range was very strenuous I thoroughly enjoyed it. A camp has been put up right in the mountains. This camp is arranged just like the camp here with tents with floors, wooden mess-halls, bath-houses etc. The range extends across the mountains for about 5 miles but people have moved out of their homes for 15 miles, fearing danger, tho the guns will not shoot but 4 miles. Targets have been set up ranging from 1800 to 5400 yards. The instruction is carried out as follows-each morning the 4 guns are taken up and placed in position designated by the general. The officers go up to the top of a mountain where the targets are visible and telephone lines are run from this point down to the battery. 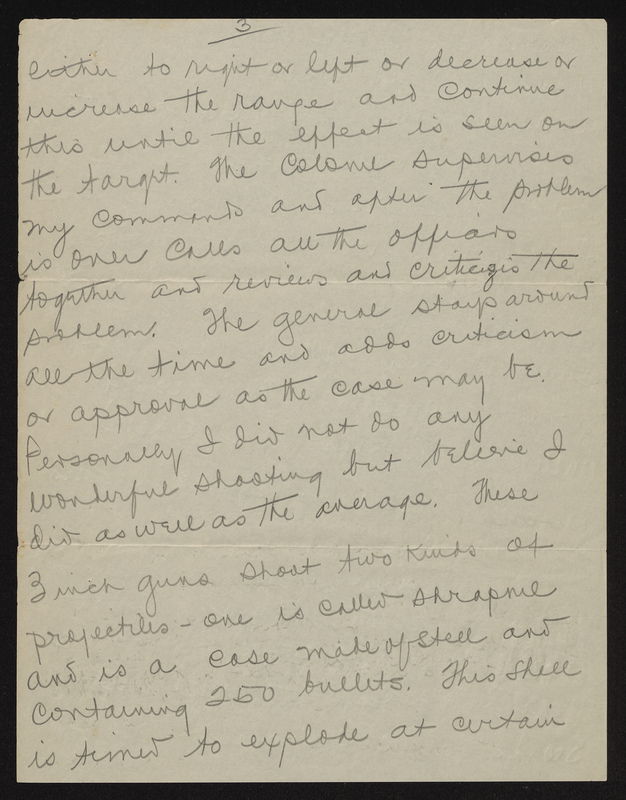 Colonel Cox3 would then show each officer some separate target to open fire at and they take the problems in turn. Often the target would be 3 miles away. A tiny black spot on the mountain-side, visible only thru field-glasses. Upon having the target assigned to him, each officer would then have to compute the elevation and direction of the guns necessary to bring the shells upon the target. For instance, a target is assigned to me-I compute the necessary data and when my turn comes, this is telephoned to the battery which sometimes is 1000 yds. away. When the guns are fired I observe the bursts of the shells and send down the necessary changes either to right or left or decrease or increase the range and continue this until the effect is seen on the target. The colonel3 supervises my command and after the problem is over calls the officers together and reviews and criticizes the problem. The general4 stays around all the time and adds criticism or approval as the case may be. Personally I did not do any wonderful shooting but believe I did as well as the average. These 3 inch guns shoot two kinds of projectiles-one is called shrapnel and is a case made of steel and containing 250 bullets.5 This shell is timed to explode at certain distances after leaving the gun and is used for effect upon troops, the 250 bullets scattering over a surface of 50 yds. radius. The other kind of shell is filled with more powder of a higher explosive power than shrapnel and explodes only when it has struck something.6 There are no bullets in this kind of a shell. This shell is used to demolish guns or fortifications. I was very glad to get a letter from Minton7 yesterday. He appears to be getting along pretty well and seems to be satisfied. I hope Brownie8 will be able to get satisfactorily settled. He has made a mistake but must make the best of it and do the best he can. I am going to try to get a pass home to see you all the last of next week. Personally I think this division will leave here on 5 or 6 weeks. Of course I know nothing about it and wouldn’t want to be quoted as having said this. I told you that I thought I would be called to the range again but all of our men and officers have returned and I do not expect now that any of the 113th9 will go back. The general4 has always thought that our regiment8 was the poorest he has but the record of both men and officers at the range has caused him to change his mind. I had a letter a few days ago from Mr. Etheridge10 the tax-collector stating that I owed taxes. I understand from you when I was at home in December that you paid him. Please have McDonald11 straighten this out with him. I am very anxious to get home to see you very soon and will do so at the earliest moment. 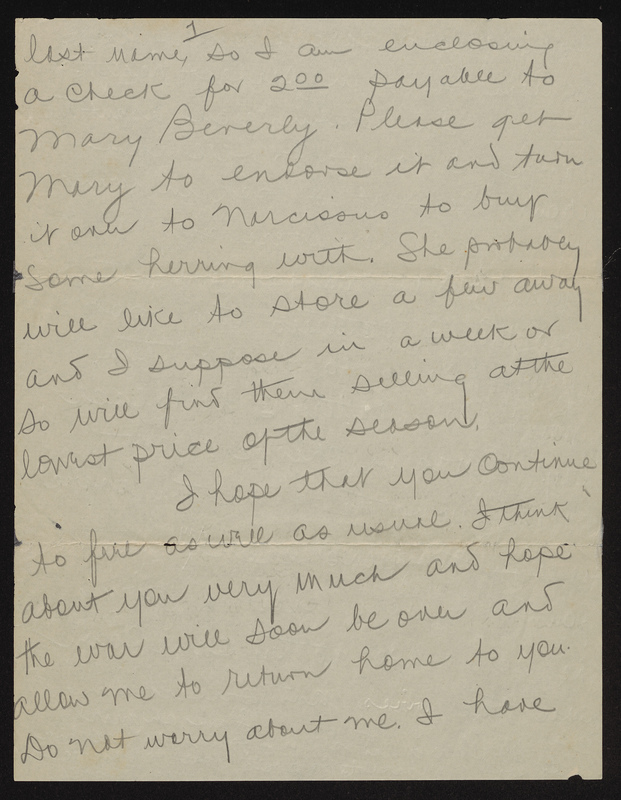 I do not know Narcissus’12 last name, so I am enclosing a check for 2.00 payable to Mary Beverly13. Please get Mary13 to endorse it and turn it over to Narcissus12 to buy some herring with. She probably will like to store a few away and I suppose in a week or so will find them selling at the lowest price of the season. I hope that you continue to fare as well as usual. I think about you very much and hope the war will soon be over and allow me to return home to you. Do not worry about me I have taken good care of myself and believe I am in perfect health. 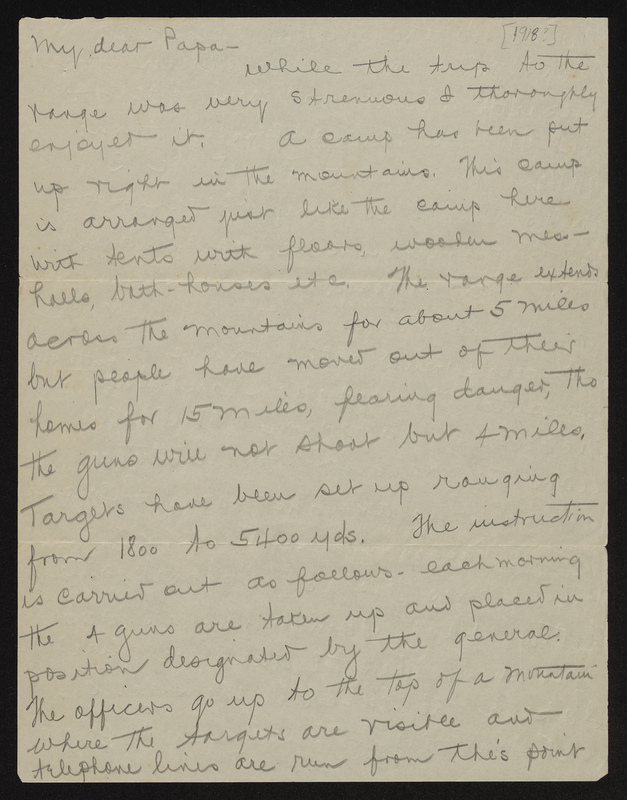 In writing you about the range I forget to tell you about the part I took in firing the guns. There were only 4 guns at the range (one battery) and the 3 batteries there took it by turns to handle them, giving each battery 3 hours each day. 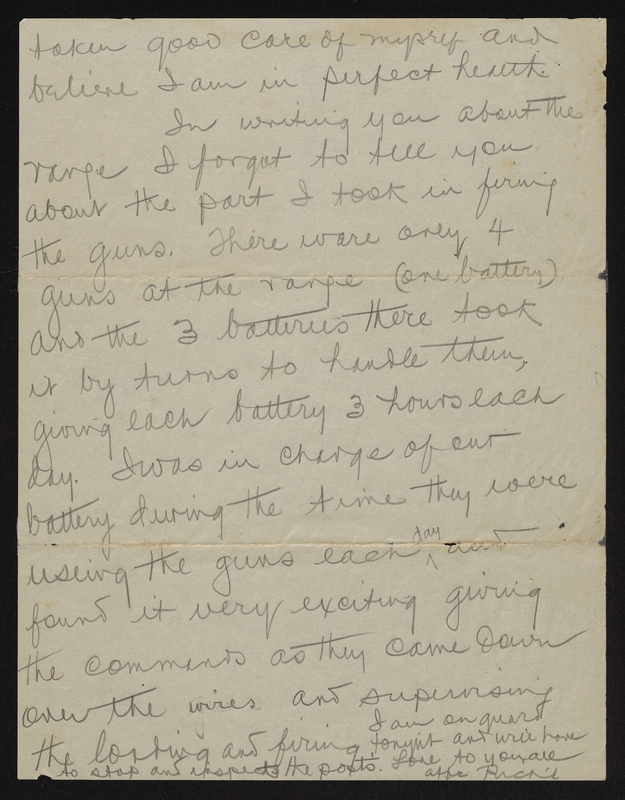 I was in charge of our battery during the time they were using the guns each day and found it very exciting giving the commands as they came down over the wire and supervising the loading and firing. I am on guard tonight and will have to stop and inspect the posts. Love to you all. This letter has no written date. 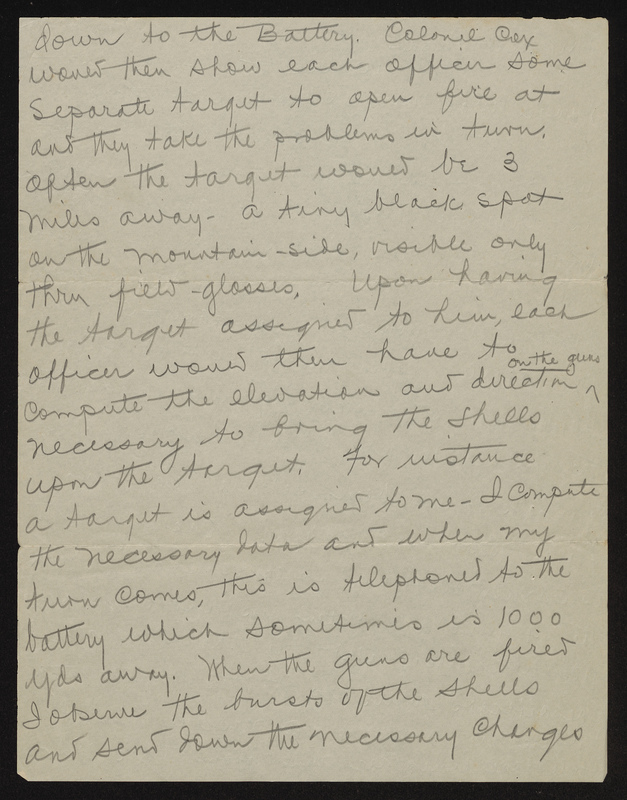 Based on the context—artillery training at Camp Sevier and his brother’s decision to resign from the army—evidence suggests mid-April 1918. Dixon’s battery, part of the 2nd Battalion, returned to the main camp from the artillery range on April 15th. George Brownrigg Dixon left the army on March 27th. 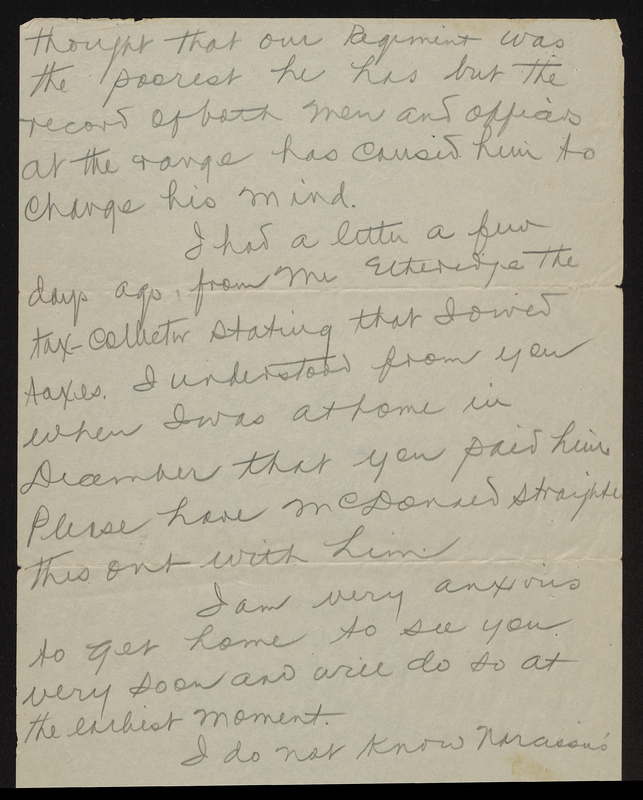 The letter also contains no mention of Dixon’s selection for an advance detachment to France, which occurred on April 18th. Therefore, in all probability, the letter dates between April 15th and April 18th. Father of Richard Dillard, George Brownrigg, MacDonald, Mary Elizabeth, and Elizabeth MacDonald Dixon. Prominent merchant in Edenton, North Carolina. Served as a Justice of the Peace, Recorder’s Court Judge, and city councilman. Married Sallie Dillard (1860-1910) in 1886. Commanding officer of the 113th Field Artillery. Also served as a state legislator and judge. Biography included in the North Carolina Dictionary of Biography, link: http://www.ncpedia.org/biography/cox-albert-lyman. Brigadier general. Born in Maine, Gatley graduated from West Point in 1890. Fought in the Philippine-American War and the Mexican Expedition against Pancho Villa as an artillery officer. 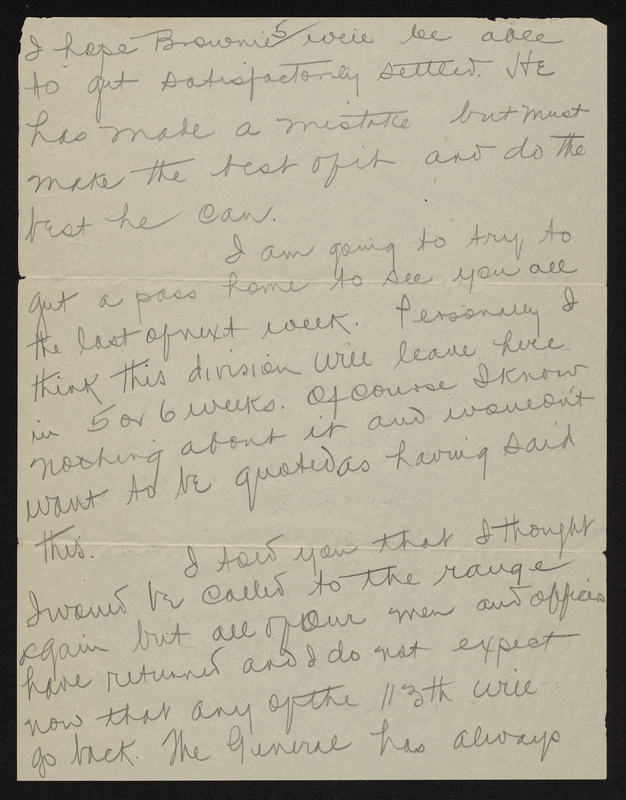 Sent to Camp Sevier as the original commander of the 55th Field Artillery Brigade, which included the 113th Field Artillery. However, in July 1918, Gatley took command of an artillery brigade in the 42nd Division, which he led through the war. Served in the army until his death in 1931. For an explanation of shrapnel shells, watch this video from Indy Neidell’s Great War channel: https://youtu.be/rLSP2PcTkz0?t=1m55s. For an explanation of high explosive shells, watch this video from Indy Neidell’s Great War channel: https://youtu.be/rLSP2PcTkz0?t=2m54s. Younger brother of Richard Dillard Dixon. Attended UNC-Chapel Hill from 1910 to 1911. Worked as a salesman for his father from 1911 to 1916. Moved to Plymouth, North Carolina in 1916 and opened a wholesale grocer with his younger brother, George Brownrigg Dixon. Called up by the draft, Dixon enlisted in the US Navy in Norfolk, Virginia on December 13, 1917. He became the Chief Storekeeper at the Naval Ammunition Depot, Mine Plant Barracks, Portsmouth, Virginia. He continued in this role after a transfer to the Naval Training Camp in Pelham Bay Park, New York. Never left the United States during his military service. After his discharge on January 5, 1919, Dixon returned to Edenton, where he worked as an office manager for a cotton and peanut commodities broker. Upon his father’s death in 1923, Dixon assumed control of the family mercantile business. Younger brother of Richard Dillard Dixon. Attended UNC-Chapel Hill from 1914 to 1916, where he belonged to the Phi Delta Theta fraternity. Went into the wholesale grocery business with his older brother, Minton Hughes Jr., in Plymouth, North Carolina from 1916 to 1917. Enlisted in the North Carolina National Guard on May 25, 1917. Due to his college experience, selected for officer’s training on December 27, 1917. Commissioned as a 2nd Lieutenant in the 119th Infantry, Dixon resigned for mysterious reasons on March 27, 1918. About two months later, he reenlisted, this time in the Marine Corps. After completing basic training at Parris Island, served at the New York Marine Corps Barracks in New York City. Reached the rank of corporal. Never left the United States during his military service. After his discharge from the Marines in February 1919, moved to Suffolk, Virginia to work as a manager for Winborne & Company, a wholesale grocer. Later became a salesman for the local peanut growers association in Norfolk, Virginia. Ultimately returned to Suffolk, where he worked as the Secretary -Treasurer of the Benthall Machine Company, a firm that manufactured peanut pickers, until his death. Thomas J. Etheridge, “Mr. Etheridge,” (1864-1937). Edenton businessman and town tax collector. Born in Camden County, North Carolina, Etheridge moved to Edenton after his marriage in 1884. His wife’s sister and brother-in-law already lived there. Etheridge went into business with several partners, operating a grocery store and dry cleaners. Appointed as the town tax collector prior to World War I, he held the office for over ten years. Younger brother of Richard Dillard Dixon. Attended UNC-Chapel Hill from 1915 to 1916. Returned to Edenton, where he worked for his father. Did not serve in World War I. After his marriage in 1939, moved to Elizabeth City, North Carolina where he worked as a fuel oil dealer for Sinclair Oil Company until his retirement to Nags Head, North Carolina in the mid-1960s. African-American domestic servant for the Dixon household. Listed in the 1910 US Census as the widowed mother of five children, four under the age of eleven. Elder sister of Richard Dillard Dixon. Never married, and lived her entire life in Edenton, North Carolina.